The EVH® 5150III® LBXII is a 15-watt guitar amp head that packs an extraordinary and powerful punch. This 2.0 version of our diminutive easy-to-carry “lunchbox” head features the famous Green and Blue channels, delivering sparkling clean tone and punchy gain to inspire unlimited artistic expression. Armed with four ECC83S (12AX7) preamp and two EL84 power tubes, the LBXII also includes dualconcentric gain and volume controls for precise and independent control of each channel, as well as shared EQ presence and resonance controls. Dial in a crystal clean tone or turn the gain up for a bluesier counterpart on the Green channel, and when you are looking to bring the house down, hit the onebutton footswitch and select the Blue channel for a tight and compressed overdriven tone with sustain for days. Bedroom players can utilize the 1/4-power switch to reduce the head to 3.5 watts and avoid disturbing the rest of the household, while studio and live musicians can leverage this same feature to turn up the head for a squeezed and spongy tone. 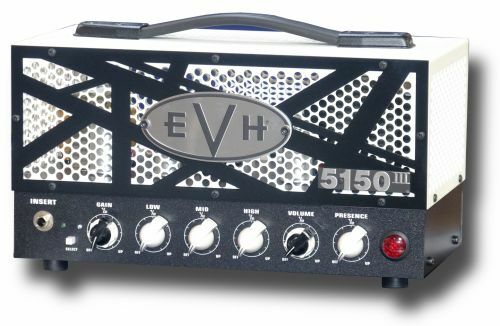 Boasting exceptional construction, fierce tone and distinctive style with a black control panel and white metal grill cage with iconic EVH striped motif, the LBXII is a phenomenal performing amp.